The Acer Predator is a serious hardware for serious gamers. It is a full 4K monitor capable of overclocking to 180Hz refresh rate at 1080p and can deliver crisp 4k resolution if that’s what you prefer gaming at. What sets this TN panel monitor apart is the 1ms response rate without sacrificing on the color gamut. Moreover, thanks to G-sync support, you can enjoy flawless gaming at super high refresh rates without any screen tear. 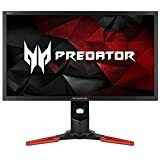 Probably the biggest advantage of this well priced Acer Predator monitor is its ability to scale down to lower resolutions and increase refresh rates at will. When you upgrade your graphics card to a more capable 4K setup, you can always go full UHD without losing performance or quality. Well priced considering its gaming pedigree. Cutting edge design with a sturdy stand that allows for customization of viewing angles and height. G-sync for Nvidia graphics card users. TN panel lacks in color reproduction. The monitor will need intense color calibration straight out of the box. Pixel Pitch: 0.16mm. Flicker-less Technology-Reduces annoying screen flickering that can cause eye strain when viewing the monitor for long periods. The Samsung 4K monitor is a perfect balance between color reproduction, display quality and gaming performance. This monitor is cheaper than most competitors and is an excellent choice if you do more than competitive gaming. Video editing, image and graphic processing all look splendid on the large display with accurate reproduction of colors at an affordable viewing angle. The monitor supports FreeSync technology form AMD allowing AMD graphics card users an improved gaming performance. It has the capability to receive input from multiple displays and can even split the screen to show each input separately. As for gaming experience, this is the best money can buy without spending exorbitantly for a true 4k 60hz performance. Extremely responsive. Perfect for MOBA games. Multiple input options include HMDI 2.0 and Display Port. Excellent quality images with least color calibration needed. The stand is a bit weak and wobbles under pressure. Handle with care or use a mounting arm instead. Acer makes the most beautiful gaming monitors among all brands without breaking the bank. 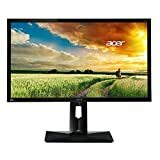 The Acer CB281HK is no different except that it is a 4K FreeSync monitor with a response time of just 1ms. Yes, this monitor does not cost much and if you use an AMD graphics card capable of delivering 4K content, the FreeSync technology will enhance your gaming experience. The monitor does not boast of several advanced features and is a simple 4K device that renders crisp images on screen. It has sufficient brightness and contrast with a good color reproduction in most conditions. Inexpensive option for AMD graphics card users. No-frills setup with simple options to immediately get started. Sturdy stand can adjust to suit your viewing angles. 1ms rapid response time with 4k 60fps support. Not that great for video rendering and image processing. Our personal favorite, the LG 27UD68 4K monitor provides everything you will ever need to game competitively while enjoying high quality pictures with zero screen tearing. Even for folks with Nvidia graphics cards, this monitor is far superior to any HD G-sync display. 4K at 60fps with 99% sRGB color gamut and IPS quality display ensures a crisp viewing experience. In fact, in all our tests we felt this monitor had the utmost clarity. By far, the 27UD68 is the most sensible choice for a 4K monitor, especially if you intend to do more than just play games. Picture in picture allows you to stream from multiple displays, split the screen and multitask better. Moreover, with monitor controls accessible by the mouse, this monitor is a breeze to configure on the go. Well rounded off features with a little for everyone. Gaming experience with FreeSync is at par with the best gaming monitors. 99% sRGB color gamut with excellent brightness and contrast. Slightly lower response time at 4ms. Screen glare can get irritating at times. Geared towards non-gamers, do not underestimate the AOC U3277PWQU. It is the only VA panel 4K monitor in our list that we believe gamers will appreciate. Naturally, the monitor delivers crisp and vibrant images at 4K resolution and a 4ms response rate. However, what sets it apart is the number of inputs it can take and the massive 32 inch screen size. Yes, this is the largest screen size in our list that is great for gamers and non-gamers alike. A top seller on Amazon and other places, the AOC U3277PWQU needs hardly any calibration out of the box and will serve you well for years. Even when you finally decide to upgrade to a more capable gaming monitor costing over thousand dollars, you will continue to relish the picture quality of this AOC monitor. 32 inch screen size with superb color reproduction. Narrow bezel with 3W dual speakers. 4K 60fps nascent resolution with support for lower resolutions at higher refresh rates. VA panel offers vivid clarity. There is a slight halo around the screen edges and colors seem a bit washed out without calibration. If you thought graphics cards in 2017 were a jump in performance over the past generation then wait till you look at the current crop of 4k monitors. It is often said in gaming circles that your setup is as good as the monitor you use. A capable gaming monitor brings out the best performance from your hardware, but a 4k gaming monitor is a huge jump up from even a 2k monitor. Increasing the pixel density of a screen does not necessarily lead to better gaming performance. Instead, you should look at more than just the resolution of the monitor. The real concern is that current generation graphics cards while capable of handling VR with ease, find it hard to deliver the required frame rates on 4k resolutions. Even a single GTX 1080 card cannot always maintain a high 60fps at 4K resolutions in most games. Naturally, the question is whether you should invest in a 4k gaming monitor. The content for television hasn’t yet completely moved into the 4K realm. Yes, companies like Netflix, Amazon Prime Video, and others have begun filming in 4K, but the majority of the content is still geared towards 2K UHD at most. Hardware is the current limitation when it comes to 4K performance. The trick is to invest intelligently in the right equipment and choose a 4K gaming monitor best suited to your setup. We at Armchair Empire have you covered as we do not just blindly discuss 4K monitors but also spend some time explaining what you will need to bring out the most on any 4K screen. Obviously, the first thing you need is a capable graphics card. In the case of 4K gaming, you will almost always need two graphics cards in SLI or Crossfire to get the right results. Remember, 4K in gaming parlance refers to 3840 x 2160 resolution. It is not dependent on the screen size though 27 inches is the minimum size of screen capable of showing the clarity and pixel density afforded by 4K viewing. Unlike console gaming where the console and game makers decide the resolution and graphics quality, PC gamers have the option to push their graphics settings to the max. With 4K gaming, be ready to sacrifice a little and run at Medium to High. Even with a double or triple SLI/Crossfire setup, your gaming rig may suffer from a drop in framerates if you push all settings to Ultra. Keep in mind that combining the power of two or more cards does not automatically double or triple the performance. SLI and Crossfire both produce a jump in performance of 30% to 45% depending on how well a title has been optimized for multiple GPU setups. Yes, games too must be optimized for SLI and Crossfire. The alternative is to reduce the graphics settings and push the resolution to 4K at high refresh rates, which is what we would suggest on a 4K monitor. The difference in quality is minimal and getting smooth framerates on a 4K monitor more than makes up for the drop in graphic quality. You won’t even notice the change, but you will see more details on a 4K screen. Certain games, especially open world titles look splendid on a 4K display because of the vast open spaces and complex landscapes. The next thing you need to enjoy a 4K gaming experience is a capable set of surround sound speakers. What is the use of a theatre grade monitor if you only have left and right stereo setup? Do yourself a favor and get a 3D or 5.1 gaming speaker setup. We have already reviewed a few excellent gaming speakers that you can select from. Alternatively, you could invest in a decent 3D stereoscopic gaming headset, which costs less but offers better spatial distribution and sound clarity. A 4K gaming monitor will always have the native resolution of 3840 by 2160. In fact, 4K is approximately four times the jump in resolution from a 1080p screen. Naturally, the pixel density of a 4K screen is much higher. You will find monitors with higher screen resolution than 3840 x 2160 but those are rare and we do not suggest investing in a higher resolution screen, at least for the next few years. Remember, a single 1080GTX 8GB graphics card cannot provide stable 60fps gaming at Ultra in most games on a 4K monitor. The response time determines whether a monitor is competitive gaming grade or a daily use screen. Competitive gamers will never game on monitors with a response time of 4ms or more. Ideally, you should look for a monitor that has 1ms response time. Less the response time, smoother and sharper the movements on screen. Remember, the response time is simply a measure of how quickly individual pixels can change from a state of absolute darkness to complete white. Naturally, 1ms response time will give you faster and smoother pictures, which can be the definitive edge in a competitive scenario. Many gamers are divided on the topic of refresh rates. Some believe a high refresh rate helps them gain a competitive advantage whereas others think, the benefit is minimal to consider a prerequisite for a gaming monitor. We believe a refresh rate of 60Hz or higher is always beneficial. Unfortunately, maintaining a steady 60hz framerate at 4K resolution with current generation hardware in modern games is difficult. The best workaround, therefore, is reducing graphics quality while maintaining 4K resolutions. Even the, you cannot reach 144Hz or higher without significantly cutting down on image quality. Hence, we believe any monitor capable of delivering 60Hz refresh rate at 4K nascent resolution is a good gaming monitor. Together the dynamic contrast and screen brightness determine how well a monitor delivers dark and bright images. A good gaming monitor will have a brightness of 300cd/m2 or more and 80,000,000:1 dynamic contrast ratio. It is evident in dark areas of a game where a subtle change in the blackness can make all the difference. Monitors not capable of delivering a high degree of contrast change will always look artificial in any intense dark portions of a game. To be honest, the difference between 4K and 2K is not all that evident even on a side by side comparison. Most gamers prefer a screen size of 28 inches or more considering how close you sit to a monitor, however, the jump in quality on a 4K screen is only evident when you invest in a large monitor and observe from a proper distance. 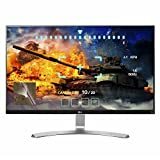 If you currently game on a 1080p HD screen and want to upgrade to a 4K display, you can start with a 27 inch or higher screen. For those currently using a 2k display, invest in a 32 inch or larger 4K display. 4K gaming is best experienced on a large screen. G-Sync 4K monitors are mighty expensive while FreeSync is a cheaper option. We advise investing in either of the two as opposed to a conventional 4K monitor. Without these technologies, your monitor will rely on an outdated technology called V-Sync that introduces double or triple buffering to smoothen images on a monitor due to a sudden change in framerates, which is all too common in PC gaming conditions. The problem with V-sync is that it increases the input lag, which can mean the difference between victory and defeat in a competitive gaming environment. With G-Sync or FreeSync certified monitors, you combat screen tearing using a combination of hardware and software enhancements. G-Sync works with all NVidia cards and is best suited to those using NVidia graphics cards whereas FreeSync is what you should get if you prefer AMD graphics cards. The conventional video input options include DVI, HDMI, and VGA. These input options work with all monitors though they are not capable of handling massive amounts of data necessary for 4K viewing. What you need however is DisplayPort, mini DisplayPort, Thunderbolt or HDMI (MHL) input. These are the newer input options that are specially designed for high data transfer rates necessary for 4K picture rendering. Always connect your 4K monitor using any of the newer input options with your graphics card to ensure highest rendering quality. Much has been said and written on the display screen types. You may even have a personal favorite. When it comes to the best 4K gaming monitor, we believe decent viewing angles is a must. Remember, 4K monitors, are usually large, which means you view the screen at different angles depending on where you look. With a high viewing angle, you won’t find any difference across the screen regardless of how you sit or game. TN and VA panels both have their advantages and disadvantages. One has a faster response rate whereas the other has beautiful color reproduction and contrast. As of 2017, all gamers should gravitate towards IPS displays with the last response time because they merge the advantages of both VA and TN panels without much compromise. In the end, the best 4K gaming monitor depends on a lot on your hardware setup and the money you spend. There are a few under $500 that can enhance your gaming experience and some above $1000 that are phenomenal. The question is what you need the most and how ready you are for 4K gaming. Our 4k monitor guide is not definitive by any means, but it should help you make an informed decision. Remember, in 2017 you are still an early adopter of 4K gaming technology. 4K gaming will take at least couple more years to become a mainstay.